Project obstacles and solutions: Roche Diagnostics was building a new L & D complex on its Indianapolis campus. Schedules dictated that the concrete decks in Building E be poured by mid-February, but sub-zero temperatures threatened this process. The decks of these buildings were specified to be poured with lightweight concrete. Lightweight concrete uses haydite, a kiln-fired stone filled with air pockets, as the coarse aggregate in the concrete mix. Lightweight concrete is commonly used in upper decks to keep floor weights lower than that of traditional concrete. This limits the amount of structural steel needed to support the upper floors. In theory, this saves time and money on a multi-level building. However, to properly hydrate the cement in the mix, haydite has to be soaked in water prior to mixing the concrete batch. 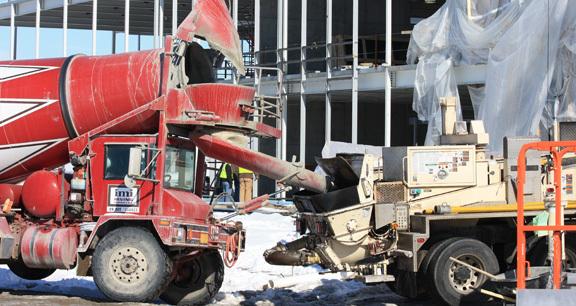 For this reason, lightweight concrete is commonly poured when ambient temperatures are well above freezing. However, the schedule on this job required the concrete be delivered in sub-freezing temperatures. IMI plant personnel worked with IMI QC/QA to heat their water and properly hydrate the haydite without freezing it. Getting the concrete properly hydrated, batched and delivered in cold weather was only one part of the obstacles on this job. Getting the concrete to cure properly once it was poured became another issue. Nighttime temperatures were dropping below zero and there were small windows when daytime temperatures were warm enough to pour. IMI QC/QA added imix FreezeGuard, to the concrete during the batching process. Adjusted to the ambient temperatures,imix FreezeGuard, is a proprietary admixture that is guaranteed to accelerate initial set times in cold weather. Since the concrete had to be pumped to the upped decks, timing of the deliveries was critical. If the concrete sat in the trucks even a few minutes too long, the mix would clog the pump. The ambient temperature was constantly monitored, including the generated heat from lower decks, to make sure the mix would remain workable while it was being poured. In all, IMI delivered 1,300 yards of lightweight concrete for this job. To learn more about cold weather concrete solutions, including our imix FreezeGuard, guarantee, click here.